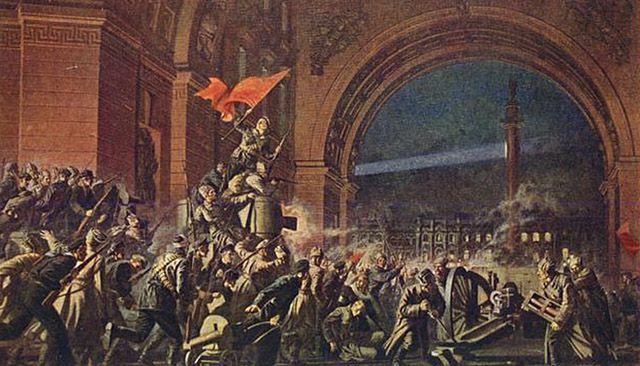 There was considerable debate in Marxist circles before the Russian Revolution as to whether Russia could have a proletarian revolution or not. Whether it should limit itself to a bourgeois revolution, like the French one. Marx being the scientist that he was, was open to the possibility; as we couldn’t know for sure, in advance, that it wasn’t possible. However, given the fact that workers made up probably less than 5% of the population, a pure workers’ revolution didn’t seem realistic. But could an alliance with the peasants, rather than the emerging capitalist class, defeat the feudal class of landowners & continue to communism rather than stopping at capitalism? Trotsky, who was initially a Menshevik, not a Bolshevik, thought so & his theory of permanent revolution won over Lenin, who was initially sceptical. Lenin knew though that Russia could only be the ‘weak link’ in the world economy & that ‘socialism in one country’ wasn’t a possibility. The revolution had to spread, preferably to Germany, France & Britain for it to be successful. It didn’t, largely due to the reformism of the Social Democratic Party in Germany & the Labour Party in Britain. Not forgetting the involvement of British & other foreign troops in fermenting civil war. Imperialism was benefiting a large proportion of the working class in the advanced countries, who were seeing improvements in their standard of living in the lead up to WWI. Revolution might have happened in defeated Germany if the SDP had listened to Rosa Luxemburg & concentrated on Workers’ Councils as opposed to parliament & electing MP’s. The result was Russia was isolated. Lenin turned to capitalism with his New Economic Policy. When he died there were essentially three forces in competition: the right-wing NEP supporters led by Bukharin, the left-wing supporters of the workers’ interests led by Trotsky, & the growing bureaucracy of the Party led by Stalin. With the world revolutionary period receding the only realistic options were a counter-revolution & capitalism, or the Party bureaucracy trying to impose communism on the peasant class who were unsympathetic (they just wanted ‘their’ land). Hence the descent into a one-party dictatorship & the execution of many communists, including Bukharin & Trotsky. The material conditions were not there for communism in the USSR & even Stalin recognised he never achieved communism (a classless society). That’s not to deny the many achievements in attempting to build socialism in the USSR in terms of healthcare, education & employment for all. Mao’s China was also a peasant society. The ‘Great leap Forward’ & the ‘Cultural Revolution’ once again showed that you cannot impose communism on a class that don’t want it. Again the material conditions were not ripe. The Communist Party of China since Deng have tried to ‘ride the capitalist tiger without being eaten’. Whether Xi thinks the material conditions are now ripe & the CPC is still communist at heart remains to be seen. The recent party congress offers some hope. Just about anywhere else you care to mention, North Korea, Vietnam, Cuba, etc. you have the same problem of essentially peasant dominated economies isolated in a sea of capitalism. Either one-party dictatorships try to keep out the CIA or US puppet regimes get installed, e.g. Chile, Nicaragua, etc. As for Eastern Europe, such as East Germany, this was primarily a Soviet buffer with Stalinist puppet regimes, even if they did have some genuine socialist elements. Socialism/Communism can only be an act of the workers, a participatory movement where real power lies with workers’ councils (Lenin’s book ‘State & Revolution’ is quite clear on this). All the time we have an economy based upon profit, we will need to constantly grow & so destroy the planet’s ecology. The declining rate of profit on real productive investment & it’s ‘denial’ by speculative finance capital (essentially printing money) only increases inequality & ensures a depression. Humanity can do much better than this & free itself from this madness. Capitalism’s time has passed. We need another revolution!